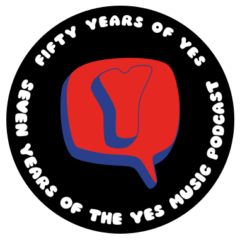 The forty-first episode of the Yes Music Podcast featuring the ‘Symphonic Music of Yes’ compilation. Are these arrangements better than the Magnification tour ones? With some key Yes band members, is this the treat one would expect? Sorry but this is Yesmuzak to my ears. (I agree with you – what were they thinking?) The (very) few good moments do not redeem this album for me. Hi Ken. So glad to hear your Friday routine! I’m glad I can be of service! Keep listening! Oh my I really enjoyed your comments on this one “wallpaper Music” lol and Yes anytime Mr Howe has to play any Trevor Rabin he becomes very stiff…not the Mr Howe that we all enjoy so much. I guess like it goes their is a season for everything and this just must have been one of those things that “they” thought would be a great idea and again like you had mentioned why does it take so many to reproduce what five people did? I believe when you mentioned “Soon” you miss spoke about how Rick would have played it however we all know it was Patrick Moraz that did it original but hey I liked it when either one did it so no biggie. Thanks for spotting the Moraz mistake – I’ll mention it in the next episode. Glad to hear you think JD is doing well. I hope he comes to the UK! Hi , This is Stormy from Phoenix. I am replying to the Symphonic Yes music episode # 41, a bit late, sorry, but I do have a sore spot towards this CD. David Palmer had been doing several albums of this concept of quote unquote ‘symphonic music’ tributes to various prog bands. First was Genesis, then Jethro Tull, and later Yes and Pink Floyd. The problem I have with David Palmer’s work here, is that they are not symphonic, they are a rock ensemble with an orchestra thrown on top. I think there should be rules to this sort of thing so as to make them a truly classical styled symphonic arrangement to these masterful, extended compositions, which are so deserving of such a concept. Especially Yes. First rule, no guitars, no bass. There are plenty of symphonic instruments to cover this spectrum. Contra bass and bassoons, as well as tubas, french horns and such, should be used for the bass parts. Secondly, and very importantly, no rock drum kits, no trap sets. The symphony offers a wide assortment of percussive instruments to cover these rhythm parts. How about some tubular bells? Pun intended, as the symphonic albums to Mike Oldfield’s early works set a great example as to how this should be done. No synthesizers, the only keyboard to be used would be grand piano. These should not sound like rock songs, but classical pieces of music. The only vocals would be done by a choir. Also, no members from the band involved to take us out of the purely classical element we are striving for. All following the strict classical arrangement. Songs like Roundabout, Owner of A Lonely Heart and All Good People would not work in this mode of composition. We want Beethoven, not Boston Pops. However, All Good People with a massive choir and strings handling the rhythm parts would be refreshing. I really, really want to hear this album. I mean I hunger to hear this. I love classical works like The Firebird Suite and Holst’s The Planets, and Yes music, done as if composed by the masters, would be such an experience, mere humans could not describe it. Anyone agree? Anyone out there share my great desire to hear this album done proper? Anyone with the forthwith all to take the project on? I mean, I really want to hear this done right. Thanks so much for the fascinating comment, Stormy. I agree about the ‘thrown on top’ nature of the arrangements. It should be either/or – band or orchestra. The only other possible exception might be the Concerto for Group and Orchestra by Jon Lord, featuring Deep Purple – do you know it? Yes – Boston Pops, there was a disastrous idea! I would also love to hear the album you describe – I winder if it will ever be created? Thanks for the kind words also about the podcast – it makes it all worthwhile when I know people like you are enjoying it!